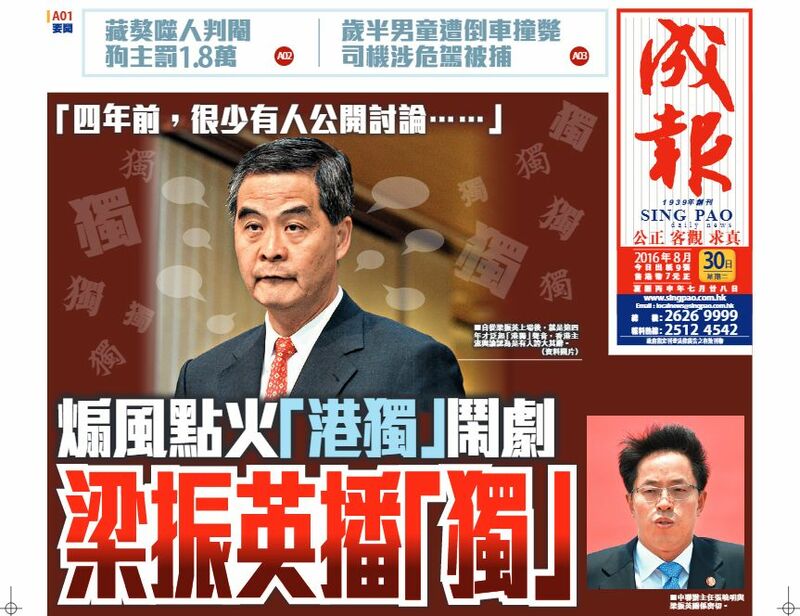 Pro-Beijing Chinese-language newspaper Sing Pao carried a commentary on its front page on Tuesday claiming that Chief Executive Leung Chun-ying was “inciting” the Hong Kong independence movement with the help of the China Liaison Office. The author urged the Chinese disciplinary agency stationed in Hong Kong to investigate Leung and the office, which is an organ of the Beijing government in the city. 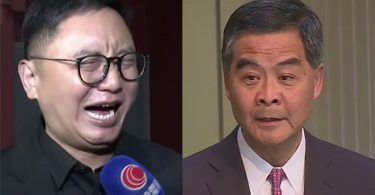 “In fact, Hong Kong independence has no market in Hong Kong… Leung Chun-ying deliberately encouraged Hong Kong independence to consolidate the authority of his governance and the hawk faction,” it read. It said that there was barely any talk of independence before Leung came to office. It also criticised Leung for only being able to attract incompetent figures to work for him. It said the Liaison Office was happy to see a “core interest group” seeking the approval of Leung and the office. Sing Pao, August 30, 2016. Photo: Sing Pao. It quoted “political figures” whom the author knew as saying that they received “warm reminders” a day after they made statements in disagreement with Leung. The author claimed there were threats made to those who spoke out, and that it was a common experience for many other political figures. 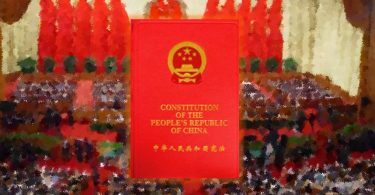 The commentary urged China’s Central Commission for Discipline Inspection (CCDI) to investigate the Liaison Office. It specifically mentioned Li Qiufang, a member of the commission who has been stationed at the Hong Kong and Macau Affairs Office of the State Council since January in order to oversee discipline inspection work in the Hong Kong and Macau Liaison Office. “Hong Kong society expects the CCDI to investigate the work and the role of the Liaison Office along with a recommendation to disband the group that hurts the interests of the country and Hong Kong,” it read. Meanwhile, the Sing Pao Newspaper Company Limited was approved by the Registration and Electoral Office (REO) to conduct exit polls at designated polling stations on Sunday. It was the first company linked to a newspaper which has been approved to conduct exit polls since the 1997 handover. 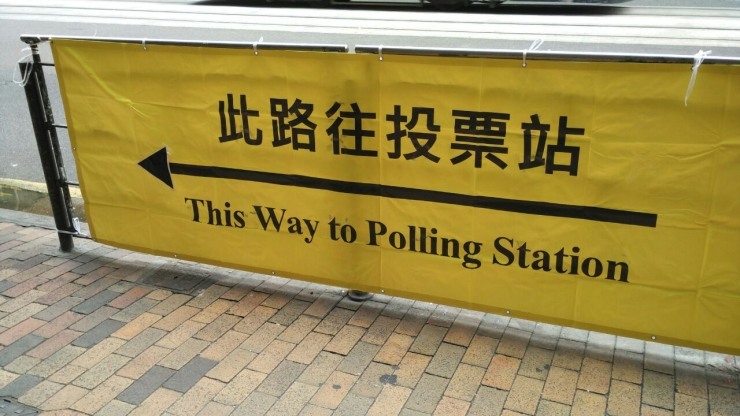 The two other bodies approved were the Public Opinion Programme of the University of Hong Kong, and the pro-Beijing Hong Kong Research Association, which have conducted exit polls in past elections. Sing Pao Newspaper Company Limited is a subsidiary of Sing Pao Media Enterprises Limited, which owns the newspaper publication. The company will have 145 interviewers conducting exit polls at 295 polling stations. The three organisations are required to make a statutory declaration not to announce the results of the exit polls before the close of the poll. The REO also stated that they should not make specific remarks or predictions related to the performance of any individual candidate or candidate list before the close of the poll, so as not to affect electors’ voting intentions and election results. HKFP was unable to reach Leung Ho-man, the person responsible for the newspaper company’s exit polling, when using the contact number provided by the REO.